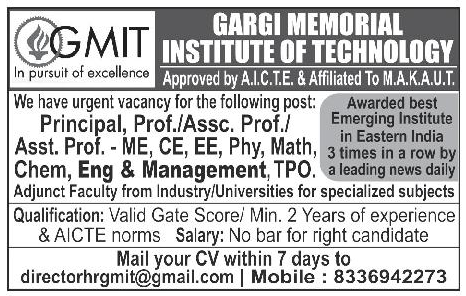 Gargi Memorial Institute of Technology, Kolkata has advertised in Samaja for the recruitment of Professor/Associate Professor/Assistant Professor jobs vacancies. Interested and eligible job aspirants are requested to apply with in 7 days. Check out further more details below. About College: Gargi Memorial Institute of Technology (GMIT), an engineering institute in West Bengal was started in 2011 by Mallabhum Human Resource Development Trust (MHRDT) in memory of Lt. Gargi Mukherjee (Banerjee).